“A new technology, designed to tame forces that could separate an astronaut’s eyeball from her retina, may also keep the one percent from throwing up,” says The Real Deal. 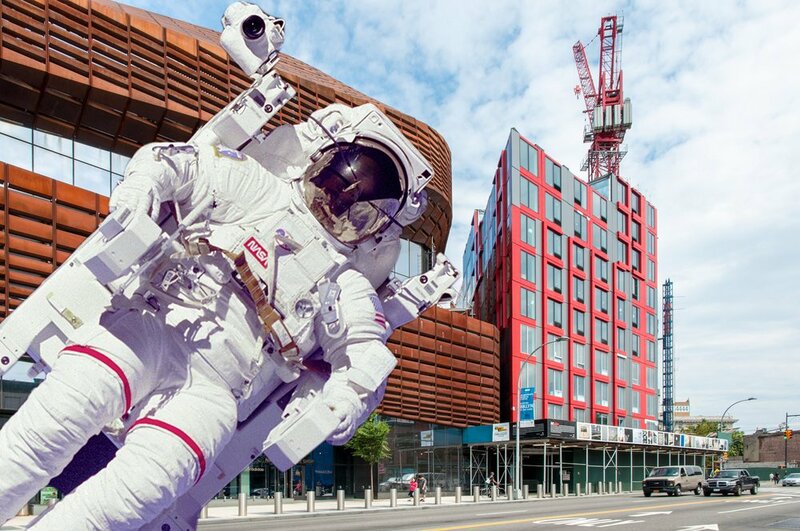 They’re talking about a fluid harmonic disruptor, a device used during space takeoffs to protect astronauts from violent vibrations, which will be employed by structural engineering firm Thornton Tomasetti at Forest City Ratner’s B2 BKLYN, the 32-story modular tower at Pacific Park that could definitely succumb to queasy-making swaying and vibrations. The firm will put six water-filled pipes on the roof of the building, making up 0.5 percent of its total mass; then the disruptor will alter how the fluid, and therefore the building, reacts to wind and other vibrations. To create the same effect, most skyscrapers use a different technology, a tuned mass damper, “which uses a steel or concrete weight to resist movement and giant tanks of water to weigh down the building” (think of it as a giant pendulum). Tall, thin towers here in New York are increasingly using dampers, including 111 West 57th Street, 432 Park Avenue, and 220 Central Park South, but they’re typically not employed for structures under 800 feet. That’s where the fluid harmonic disruptors come in, as Thornton Tomasetti, who has exclusive rights to the technology in the U.S., is marketing it as a cheaper and lighter alternative to dampers. “For the physics-averse,” explains the Real Deal, “think of the device as a balloon in the water. If the balloon contracts, the water moves toward it. If it expands, the water is pushed away.” The three-feet-in-diameter polyvinyl chloride pipes will be installed when the building is completed, expected to be early next year. If all goes well, and penthouse residents are spared possible bouts of sky-high motion sickness, the firm hopes to use the NASA technology in many supertall towers.